Furthermore, use a tweeter in a box without cross over, and it dies within seconds! Meaning: Power handling is related to the complete box system playing standard music and not to the tweeter. 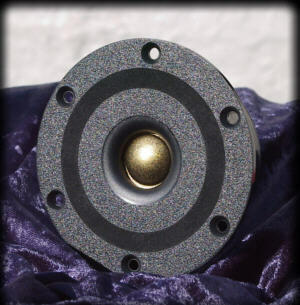 Our tweeters have been used in well-built speakers capable of handling several hundred watts! (of standard music!). As a guidance, simply use the tweeter with care and use your brains. Make sure not to expose the unit to defective power amplifiers or to use it with too small amplifiers (clipping). Use this general rule: If your normal well functioning ears can handle the sound pressure without being stressed, then the tweeter can too! It's made for human beings. Use it properly, with a proper crossover, and at least keep direct signals below approximately 2 kHz off the tweeter. Then it will handle all reasonable powers used in a normal domestic living room listened to by normal reasonable persons with normal well functioning ears. Got the picture? And still, compared to the majority of other 3/4" (19-20 mm) dome tweeters, the power handling is eminent thanks to the very high mechanical finish. All these features would be of no value if they were not heard. Therefore, try it for your-self, and be convinced! Our other customers are convinced. They also benefit from the fact, that the production quality is extremely high. Production procedures are developed during many years, with the special goal to achieve maximum control on uniformity and low distortion. This is best understood by telling you, that during the last 15 years we have shipped well over 100.000 units, and only a few handful of those have been recognized as defective as a result of our mistakes. Used in high quality loudspeakers all over the world and under very different circumstances, we have only received less than 100 units in return with faults. This is less than 1 out of 1000! We believe this to be a good measure of quality! Furthermore: Out of these few units returned, several were obviously damaged by the customer them-selves, by overloading from clipping amplifiers and other misuse. The failure rate from faults that can be related to our production therefore is far below 1 out of 1000. We believe that's pretty good! All units leaving HIQUPHON are tested at least tree times, two of which are listening tests through-out the entire frequency area. As a special test of the mechanical assembling, we test the unit through a completely crazy dividing network, giving the unit an awful bad time in the area 100 Hz to 3000 Hz to make sure, that there is no rattling or other mechanical noise at all. (This frequency area is the area in which the resonance's are most likely to generate undesirable mechanical noise if any mistakes have occurred and consequently will generate higher-order unequal-numbered harmonic distortion). The production quality is very uniform, and many customers have asked if the units were specially selected or matched. But no! That's just the way we do it. Precision and commitment combined with the many years of learning and listening. Yet of course, small differences will occur. Therefore we can offer to supply with every single unit a certificate curve-data sheet for your own further pair-matching, or we can supply the units as matched pairs if necessary (Our OW-series). An additional price will be calculated for that kind of service. All units in our OW-series are born as matched pairs, and therefore matching and data sheets are part of their prices. We can supply different custom made subversions against extra payment. Some of these are mentioned below. The Gold/Platinum option is a good example of special options. The OW3 (gold dome) and OW4 (platinum dome). We can supply the unit with diameter between ø92 to ø94 mm, as it is possible to machine the flange. We recommend that you use the standard ø94mm, but if you want for instance ø92mm diameter flange, you can have it. Normal standard version is supplied with 3 holes for countersunk screws of size M4. We can supply the unit with 6 assembling holes, if so needed. Example showing a custom made GOLD model with 6 holes and foam ring in the face plate.